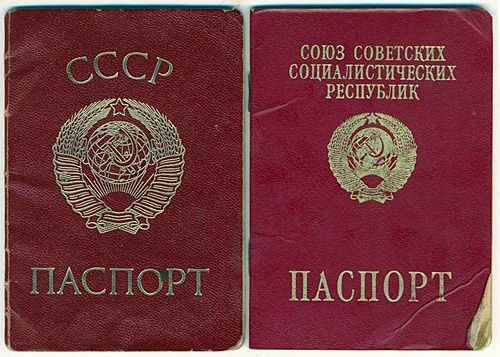 Soviet internal passport. This was the only acceptable identification document. (Photo from www.savok.name). On July 29, I turned sixteen and received my passport. My address in it confirmed my propiska. The fifth line stated my nationality: Jewish. It was derived from the nationality of my parents as listed on my birth certificate. 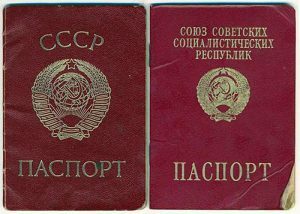 At passport issuance time, children had the right to choose their surname if their mother kept her maiden name and the nationality if they were a product of a mixed marriage. For mixes that did not involve Jews, the choice depended on the stereotypes prevalent in the specific locale. The Friendship of All People doctrine did not come into consideration, the dislike of an ethnic group did. One of the teenagers waiting for his passport when I did was born out of wedlock and had no choice but to go with his mother’s Russian surname and nationality that did not match his Middle Asian features. That mismatch made the boy anxious, with good reason. The other teenager picked Russian over Ukrainian, reasoning that associating with the Big Brother would be more prudent. If one parent was Jewish, the choice was a no-brainer. A son of a Jewish father and a Greek mother, a popular theater director opted for Greek, a nationality so uncommon that it was hard to believe in its authenticity, especially combined with a Jewish surname and patronymic. But abandoning the perilous nationality had consequences too. 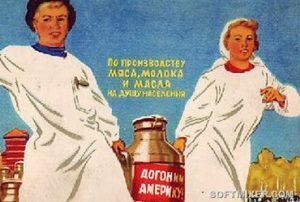 Anekdots with punch lines “they’ll beat up your mug not your passport” or “if I hire a Rabinovich I’ll hire a real Jew” illustrated the collateral damage of the discord between the fifth line, the surname or patronymic, and the appearance. And if all the ingredients blended seamlessly, the individual confronted a lifetime dilemma of whether and to whom to divulge the undesirable parentage. No matter the decision, owning a secret meant being owned by it. Covering up one’s Jewish background was a serious offense. It was an indication that the person did not believe in Friendship of All People. Personnel departments, the gate-keepers of hiring purity, kept their eyes peeled. They were not above dispatching a representative to the location that had issued the passport to a suspicious-looking or -named individual. A university professor I knew, Russian by passport, displayed remarkable modesty in career advancement for fear that digging into his records would uncover his full-blooded Jewish parentage. My colleague’s parents divorced, temporarily, so that his mother could revert to her maiden gentile surname. To improve his professional outlook, their son changed his surname to hers. However, his Jewish patronymic and Semitic features still hindered his career. 1961: Castro, Ideological Dancing, Romances, Stalin’s Eviction. In May of 1963, Fidel Castro visited Kiev. Schools and companies supplied the crowds waving placards with his portrait along his way through the city. This time, the enthusiasm was real. At least the women’s enthusiasm ‒ Fidel was quite a heartthrob and cut an impressive and romantic figure as he stood smiling in the open car. For me, 1961 was also the year when chaperoned school dances began. The record player sat next to the assistant principal. We wore school uniforms with white pinafores, braids with white bows (the only hairstyle permitted,) stockings or socks (sock-less not permitted,) no lipstick. I danced well, compliments of my Gnoyensky bloodline. We had our pick of the approved repertoire: Boston waltz, polka, krakowiak, and my favorite, waltz. The chaperone cut foxtrot and tango short if we danced too fast. Someone said that these events resembled a mix of a concentration camp and an aristocratic ball. Every February 23, Soviet Army Day, the school played host to a platoon of soldiers. Attendance was mandatory. The principal spoke about the tie between the Soviet Army and the Soviet people. The guests stood at attention and saluted when ordered by the officer. Event over, the platoon marched out in formation. In tenth grade, the Education Ministry bestowed an honor on us of entertaining allies of our motherland, Arab students studying in Kiev. The principal briefed the girls (boys did not need to attend) on the political significance of a fitting reception. We sat—white pinafores ironed, smiles pasted on, palms on knees—in alphabetical order in a square of rows facing a small contingent of dark-haired, mostly mustached men in snow-white suits in the opposite corner. The principal welcomed them, we clapped, music played. A boxy neck-less man bowed to me and held out his hand. His mustache almost touched my chest. Melting into thin air was not an option. Not discomfited at all, he danced exclusively with me. He proposed a tour of Egypt where my dark eyes and braid would let me blend in effortlessly. When the allies of our motherland departed at last, my mouth was dry and knees shaking. Immersed in study, I missed most of the flings raging between my classmates. The one that culminated in a kiss on the cheek made the biggest splash. The kissed girl was excited by the attention of the cutest boy in class and proud that she avoided a kiss on the mouth which, we firmly believed, would have resulted in pregnancy—no wonder movies that showed kisses on the mouth were prohibited for children under sixteen. As interested as we were in the subject it didn’t occur even to those from medical families with medical books at home to investigate. To round off 1961, Stalin’s body was dishonorably discharged from the Mausoleum where it had kept company to Lenin’s since 1953. It was relegated to the Kremlin Wall Necropolis. Enormous placards, stands, and headlines with that promise popped up everywhere. 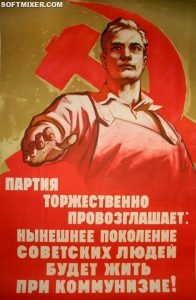 The Party earmarked 1980 as the cutover year from mere socialism to the final shining goal.